I am always excited to see OT created apps, such as SnapType app geared to OT practice. My admiration goes to those that not only have an idea for an app, but also have the persistence to see it to fruition in iTunes or Google Play Store – much less offer it for free. SnapType for Occupational Therapy (iPad; free) has done just that – currently in the iTunes Store and offered for free. Huge Kudos to the creator, a 2nd year OT student, Amberlynn Gifford at Springfield College in Massachusetts. SnapType for Occupational Therapy app is described as an Occupational Therapy app that helps students who have difficulty writing. 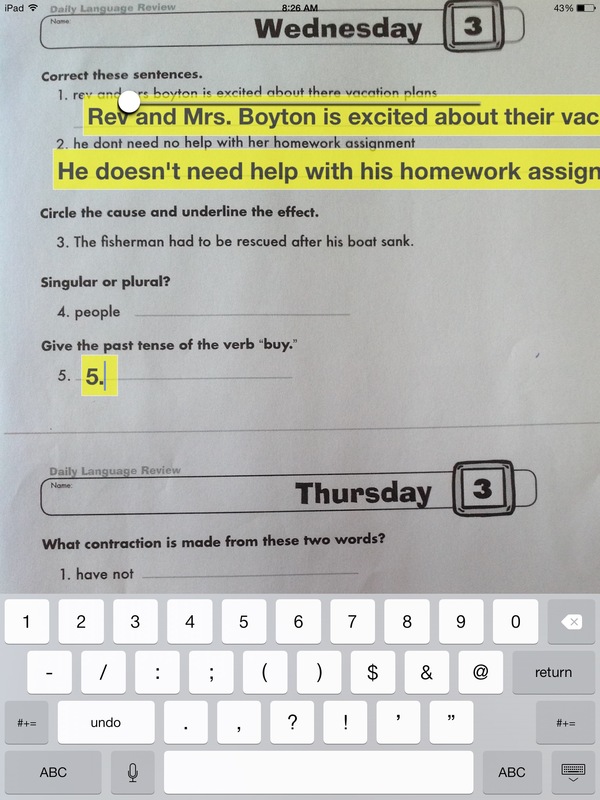 Students can take pictures of their worksheets in class and use the iPad keyboard to type in answers. 1) Use the on-screen shutter button to take a picture. 2) Tap where you want to add text. 3) Start typing using the iPad keyboard. 4) Tap and drag to move the text boxes. 5) Resize the image by pinching using two fingers. 6) Resize the text using the slider at the top of the screen. 7) Save your work by pressing the iPad home button and power button at the same time (this saves as screen capture to your iPad’s camera roll). 8) Start over by flipping the iPad face-down for 2 seconds. After downloading the app (which only demands .4 MB on your device – a good thing for those of us with an abundance of apps), it is an easy and intuitive app to use. It was simple to use with very few bells and whistles – not a bad thing at all- offering a straightforward app for young students or users who may get easily overwhelmed or distracted by lots of app buttons and tools. It worked intuitively, first offering the camera buttons to take a picture immediately after opening the app, then creating a text box where you touch on the screen. The keyboard is offered as soon as you touch within the text box and expand to the size needed for the text inserted. Text can be wrapped by inserting an enter and the voice recognition tool on the keyboard also works with Wi-Fi support. A slider tool is offered to increase the font and text boxes size. The app allowed zooming the image for an enlarged view. Text boxes can easily be moved around the image with drag and drop. In order to hold a text box (to further support completion by students), a keyboard character must be inserted. If you have Speak Selection turned on as an Accessibility option, (Settings>General>Accessibility> Speak Selection) text to speech is available for the user when the text is selected. SnapText for Occupational Therapy app is an easy to use app for elementary or beginning writers who can use a keyboard, but infrequently need to complete worksheets. 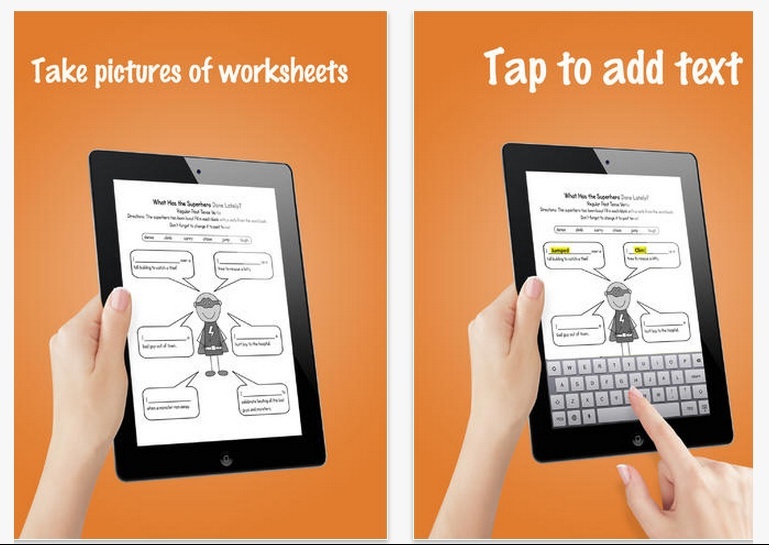 Its intuitive tools and ease of use provides students a method of producing text on worksheets with few steps. For those who need to complete worksheets more frequently in different curriculum areas may benefit from apps that provide organization methods and easy workflow to share completed tasks via email or to other iCloud tools. SnapText for OT app is definitely an app that is suited for a teacher or OT mTool kit for the appropriate student – and it is free! A huge kudo to Amberlynn Gifford for her commitment to her students and drive to develop an app based upon need!! Amberlynn Gifford can be contacted at https://www.linkedin.com/in/amberlynngifford for more information. This entry was posted in Accessibility, Activity Worksheets on Your iPad, Apps for OT's, Apps for Special Needs, Dysgraphia, Elementary School, Free apps, Handwriting, iPad, Mobile Device Use, Occupational Therapy, Special education, Writing. Bookmark the permalink. Do you have enough space on your device? What iOS are you running? It requires iOS 7 on your iPad to download. Could it be space or your iOS? I agree it is an excellent app. I am really pushing my sons school to issue him an ipad to use for his dysgraphia. This app is one of the main reasons why. His teacher and I can see how helpful this could be for him. This far the school dist. has yet to meet his IEP accommodations other than OT therapy, and just issued him a writer keyboard that is not compatible with his teachers computer or ours at home. Did I mention I am also an employee of the same school dist. I am trying to research as much information as possible on disability and tools to help him in the classroom to take back and give at his next IEP meeting. This last meeting I walked away feeling like i had been hit with a train. They are trying to take scribe out of his IEP and telling me he only needs the writer to be successful in his classwork. His teacher is also feeling the lack of support. She has voiced her issues as well and is still being shut down. I need to find a support outlet to help me with this battle. I am desperate for my son to try this app in the classroom. If you know of any other apps or help for my son can you please point me in the right direction? Thanks in advace! Tonia, Thank you for sharing. Sounds frustrating. What grade is your son? What type of writer keyboard is he currently using? What tasks specifically is he having challenges with in the classroom? Hi Carol! Can you tell me if this free version allows you to use the speech-to-text feature? We want to use to with a student who also has trouble typing…if we can use speech-to-text that would be great! Just not sure how to do it once you have the cursor where you need it…. I apologize for the delay. It has been busy! SnapType does not have a text to speech feature, but you can make the text typed talk after typing it, selecting and then using the Speak” to hear it read aloud. You need to have Speak Selection turned on in your Settings on the iPad. Another method would be to use a third party app like Keeble for text to speech for what you type. If you are looking for the whole document to read aloud you will need to use another app, such as ClaroPDF and make sure you have the document OCR’d to access the text. SnapType Pro has a speech to text feature on an ipad that has siri. We have been using the feature very successfully. Thank you Jane for sharing this information.